The Z-Wave Home Automation Bridge helps bring different home automation and smart home systems together. Technologies that would not normally talk to each other natively, can now communicate harmoniously. Inspired by open-source solutions, The Automation Bridge system builds on these solid foundations and integrates them together creating a simplified, powerful and cohesive system. Fibaro Home Center 2 and Z-Wave Gateway Controller and instantly integrate your Z-Wave Scenes and Devices with Apple HomeKit, Amazon Alexa and Google Home. 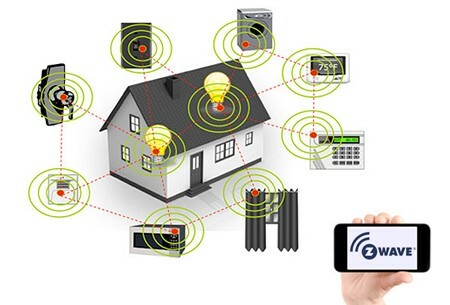 Once the Z-Wave Bridge is connected to your home network, you will be able to include your Z-Wave devices and scenes. You will also be able to control your living spaces via Amazon Alexa, Siri or Google Home. Turn Z-Wave devices on or off, dim lights and run scenes, using only your voice. Once Automation Bridge is connected to your home network and Z-Wave Controller, you will be able to include your Z-Wave devices and scenes with Apple HomeKit, Amazon Alexa and Google Home. KEYless Entry Systems simplifying Z-WAVE Home Automation. Z-WAVE is the leading smart home technology that is inside everyday products like lights, locks, thermostats and much more. These products work together to create the backbone of your Z-Wave Home Automation smart home and enable you to use your phone or tablet to create one-touch scenes that help with daily activities like: saving energy, keeping your home secure, looking after your loved ones and being more comfortable. The beauty of Z-Wave is that there are more brands, more styles and more products to choose from. You can truly create your smart home, your way. The Z-Wave protocol is an interoperable, wireless, Radio Frequency(RF) based communications technology designed specifically for controlling and monitoring that enables you to get status reading applications in residential and light commercial environments. A well-established, proven and broadly deployed (with over 100 million products sold worldwide), Z-Wave is by the world market leader in wireless control in your home, bringing affordable, reliable and easy-to-use ‘smart’ products to many millions of people in every aspect of daily life. For a more complete look at Z-Wave technology for non technologists, and to learn more about Z-Wave’s role as a key enabling technology for the Internet of Things and connected objects, please visit www.z-wave.com. Over 2400 interoperable products available, 100 million Z-Wave products worldwide. Extensively used in residential systems throughout numerous business spectrums, including ADT, Alarm.com, AT&T, DSC, GE/Interlogics, Honeywell, Lowes, Verizon, Vivint, and other prominent service providers worldwide. Found in thousands of hotels, cruise ships, and vacation rentals; including 65,000 devices in the flagship Wynn Hotel in Las Vegas, NV. Actively supported by over 700 manufacturers and service providers throughout the world. Designed specifically for control, monitoring and status operations; no interference from Wi-Fi or other 2.4GHz wireless technologies in similar band. See the frequency for Australia here. Full interoperability through layer 6 with backwards compatibility to all versions. For more in-depth technical materials on Z-Wave, please visit our Developer Section, or consider membership in the Z-Wave Alliance.